All are welcome! 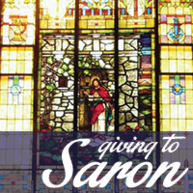 Saron’s members come from a variety of backgrounds and places in life. Whether partnered or single, young adult or empty nester, kid, senior, retired, employed, or underemployed, there’s a place for you. Wherever you are in your journey, join us for educational opportunities in faith for all ages.There are weekly occasions for worship, serving, study, and fellowship. Visitors are always welcome. Come worship with us!